Gov. 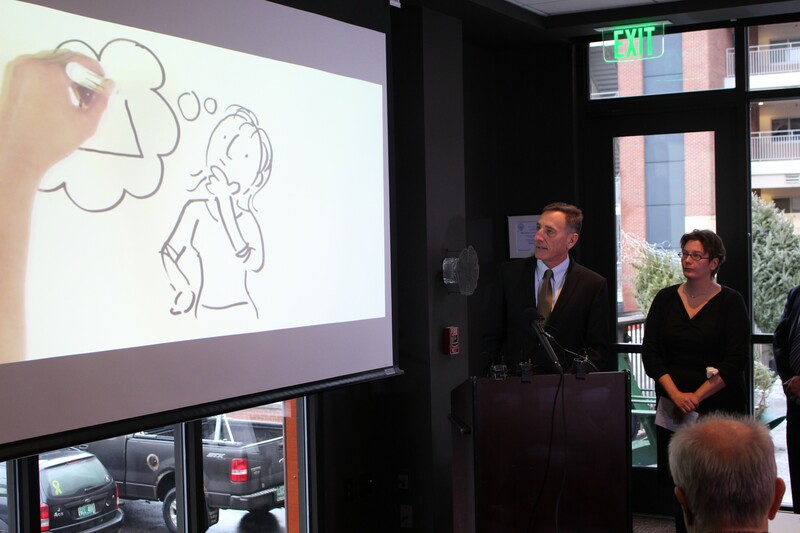 Peter Shumlin screens a new health care reform ad Wednesday at Hotel Vermont. Nearly two years after deadline, Gov. Peter Shumlin will present the legislature with a plan to pay for his universal health care proposal on December 29 or 30, he revealed Wednesday. But he swears he's not trying to bury the news in the lull of the holiday season. "That's exactly why I wanted to give you the date now," Shumlin said during a wide-ranging discussion with reporters at Burlington's Hotel Vermont. "Because I didn't want to wake up on December 31 and [read], 'It was a late-night news dump.'" So why make such an important announcement when so many Vermonters are tuned out? "My team is working really hard to get this together. And we believe we will have it together — we know we will — on December 29 or 30," he said. "We wanted to get it to the legislators before they're sworn in, just shortly — several days later." Shumlin said his financing plan, which was legally due to legislators in January 2013, would represent "a starting point for what we hope will be a transparent and thoughtful discussion" about how to achieve universal health insurance coverage. He also plans to outline a number of "benchmarks" necessary to implement health care reform. But asked directly whether he still hopes the legislature will pass his financing plan in 2015, Shumlin hedged. "We will outline benchmarks and answer those questions when we get it figured out on December 29 or 30," he responded. Asked why he wouldn't answer the question, the governor said, "We're still trying to figure out exactly what will be in the package and what legislative action will be required when in order to implement it." Does that mean he might further delay its implementation, which he has recently said he hoped would occur in 2017? "I've always said that I want to get this done as quickly as we practically can," he said. "I understand [there are] huge obstacles, huge opportunities and this isn't easy, as you know." Shumlin declined to reveal much about the plan his advisers are feverishly finalizing. Asked several times which new taxes he might try to raise, the governor demurred. His director of health care reform, Robin Lunge, said she expected the plan's overall cost to be "consistent" with previous reports, which have pegged it at $1.5 to $2 billion. She said some 425,000 Vermonters would be covered under the plan. Others would continue to be primarily covered by Medicare, out-of-state corporations and other entities. Shumlin said his administration will engage in a three-stage process over the next month to introduce the public to the details of his plan. The first step will be a public education campaign, which he described as "a good conversation in Vermont about how we're paying for health care now and a better understanding of who's paying what and how unfair it is." According to Lunge, the state has paid the company roughly $5,000 to produce the videos. They will not air on television, but will be promoted via social media. The third stage is the late December unveiling of the financing plan. Throughout Wednesday's press conference, Shumlin argued that the state must move away from a health care system he characterized as "regressive" and "incredibly unfair." To illustrate his point, the governor cited his own circumstances. "As one of the highest paid, or I think the highest paid, person in state government, as an example, I pay exactly the same amount for my family plan for health care as does the hardworking team that comes in and cleans my office at the end of the day," he said. "So we often don't talk about who pays what and how much they have to pay and what happens when you don't pay — and I think that conversation's important to have." *Corrected to reflect the fact that the five members of the Green Mountain Care Board are appointed by the governor and chosen from a list compiled by a nominating committee. The nominating committee consists of nine people selected by the governor, the speaker of the House and the president pro tem of the Senate.